Yesterday was more of the same weather wise and it got up to 30 degrees by lunchtime. The water temperature was 17 degrees and the height had dropped by about 3 inches which is a lot for a river of this size. Here at Lower Varzuga we fished in the morning where Paul Y had 2 nice fish and then we had a long lunch, a siesta and hit the river again at around 7pm. With the guides working from 9am to 6pm it was left to Jesse, the camp manager and Christopher Robinson to take the 3 clients out in separate boats. Rather inevitably things got competitive as both tried to prove that they knew the river better than the other in an attempt to put their rods on fish. Christopher has been up here for 20 years and Jesse 2 – bets were placed and bold statements were made. Kola discretion prevents me from disclosing full details but let’s just say that Jesse is walking a foot taller this morning and that Michael G was happy he chose to be guided by the newbie! 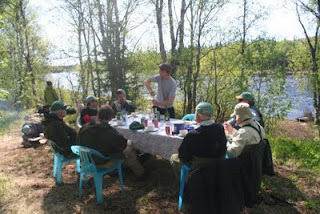 At Middle Varzuga the team also had an early supper in order to make the most of the cooler evening. They had 58 between the 12 rods and they worked hard for their fish as it really was seriously hot yesterday afternoon. 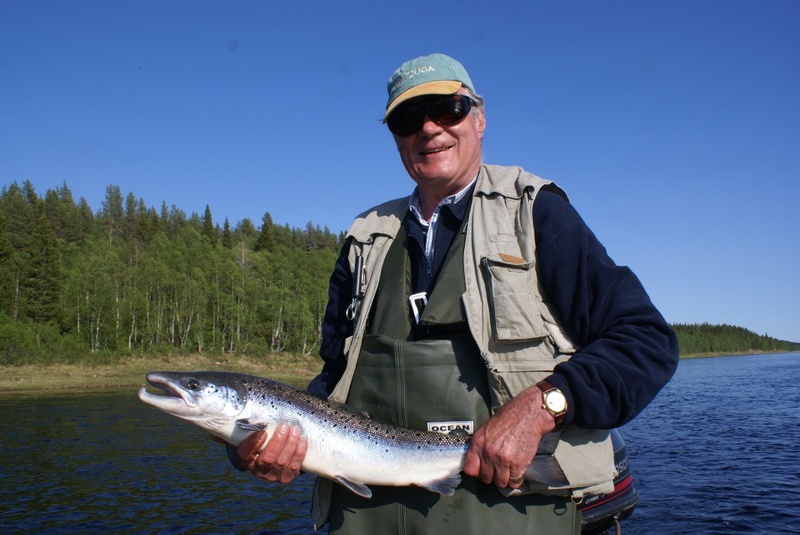 At Kitza, Roger B had a bonanza session in the afternoon with 7 fish out of Sasha’s pool. Having had a couple in the morning he finished on 9 for the day and whilst he valiantly tried in the evening for his 10th fish it would not oblige. 24 bright fish, straight off the tide, were landed to their 7 rods. Up river at Pana they are having a great week as they continue to have kinder weather (in fishing terms) to contend with. The 8 rods landed 59 fish and Jean H had a stunning fish of 18lbs from Ponsoi pool. 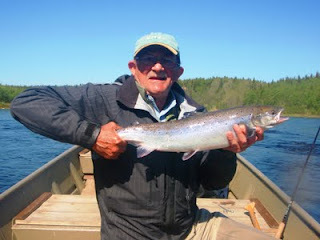 I am going home with the clients tomorrow so Christopher Robinson will be your blogger over the next fortnight and he will be based at Middle Varzuga. I hope he has as superb a time as I have had over the past three weeks. One of the major changes that we have seen in the last 5 years at Lower Varzuga has been the switch from generator power to mains electricity as the pylons slowly marched their way across the tundra to the village. At first it felt like an imposition into our wilderness world but naturally it soon becomes the norm and makes life considerably easier. Until there is a power cut! From Varzuga to Umba (a considerable distance) the power is down and yesterday was spent dusting off old generators and hoping that they would still work. 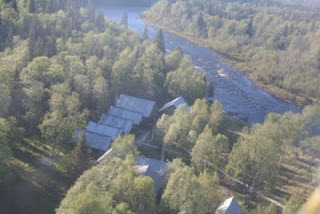 After some spluttering and coughing we now have electricity to the kitchen, the dining room and the client cabins. The first job was to make sure we could charge the computer and satellite phone (as power to the mast for mobile reception is also down) which led to all of us jostling for space over the few plugs in the kitchen that were working off the generator. Supper might be late but the blog cannot be! 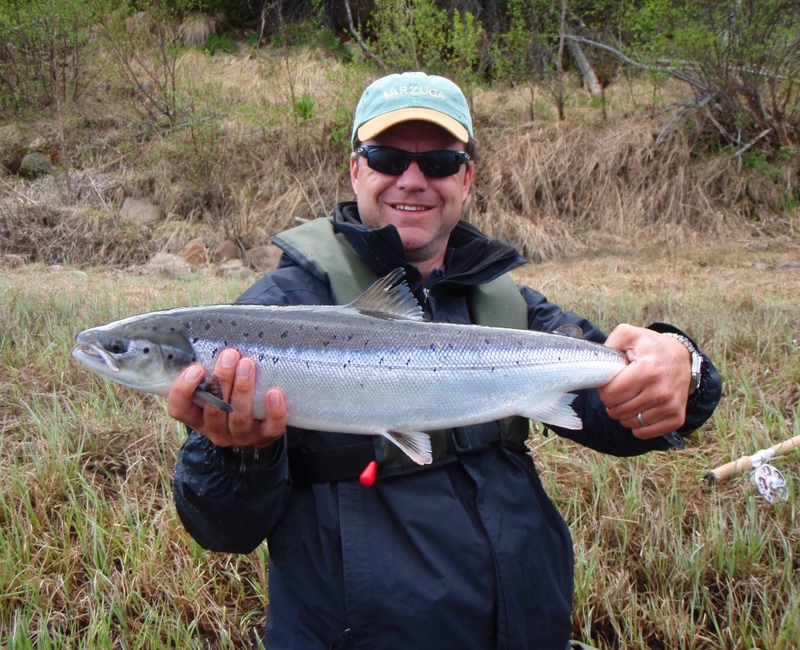 We had the mid week changeover last night and we took the seven rods over to Kitza and brought three rods plus Tim Scott Bolton back to Lower Varzuga. 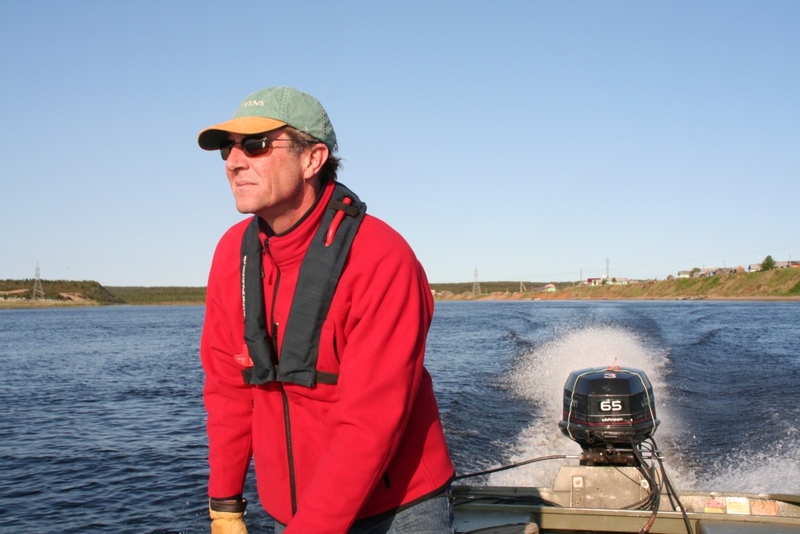 Tim is out here for two weeks as our resident artist and he will be exhibiting his work of the Varzuga in the Autumn – more on that to follow. 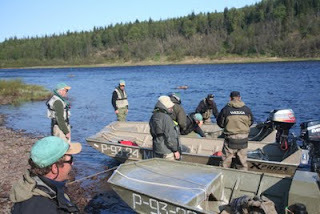 The team of 7 rods finished their time at Lower with 50 fish. Not as many as perhaps I had hoped but we have had three days of bright sunshine which has not been ideal for the fishing. The 3 rods at Kitza had 42 fish which is rather more as I would expect. Kitza is a narrower valley and is less susceptible to bright sunshine as there is more shade throughout it. 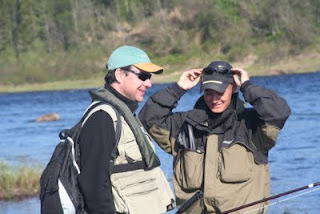 At Middle the team had 67 for the day with Emilio G taking a cracking fish of 22lbs from Birthday pool. With the power off our radio is now working on batteries and so conversations have been quite short. I could not hear Pana this morning but as of last night they were on around 40 fish for the day with a few rods still to report their scores. Whilst this temporary loss of power is boring for us it is having a much greater effect on the village (they have a saw mill, a school, a dairy and numerous workshops to power) and so there is a huge desire from everyone to re-establish communications which I hope they will have done by tonight. Back to basics is great but only for so long! Yesterday was clearly a day when the fish won. We landed a lot of fish across all of the camps but there were plenty of tales about fish lost, snapped leaders and backing being torn out of reels before the inevitable. I spent a great afternoon with Dan B at Wires and Sabacci Rapids where we had two fish to the bank and one fish that took roughly 200 yards of running line and backing before disappearing back to the White Sea. After 10 years of coming up here it still never fails to amaze me quite how strong some of these fish can be. 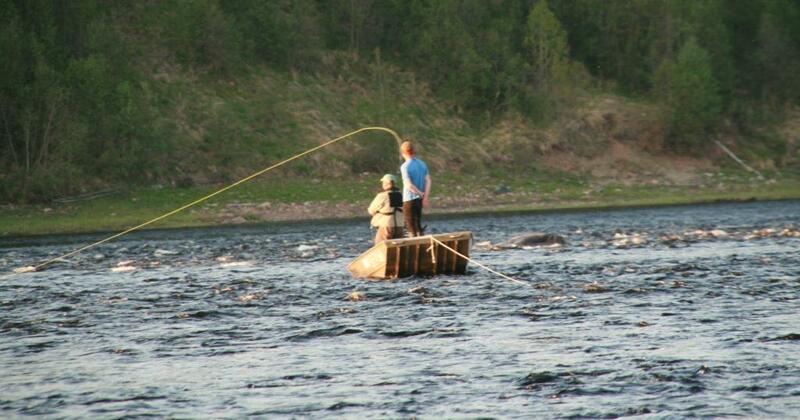 We finished with 18 for the day whilst at Kitza the three rods had 11 fish. 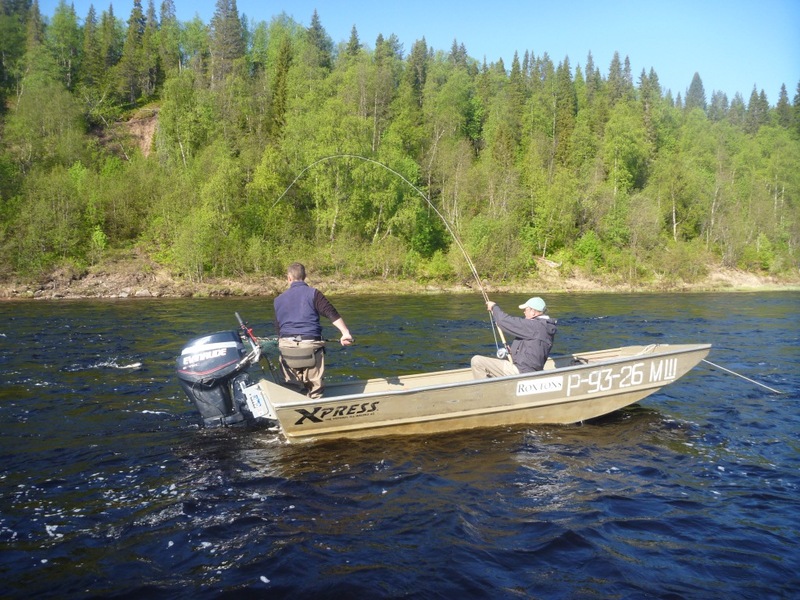 Christopher Robinson and I took a trip to Middle Varzuga last night to see the rods up there and so I missed the chance to talk to Tom, the manager at Kitza, about the action they had throughout the day but I will find out more tonight. At Middle everyone was doing well but Hugo M, on a single handed rod, was the leader of the field and he had 22 fish in the book. He knows the river intimately which makes such a difference and he also is prepared to wade deep and far which in these warmer conditions can be a huge advantage as the fish run further out in the main current. They totalled 89 for the day with as many lost again. We had another excellent day yesterday and the radio calls in the evening were a cacophony of noise as each camp manager tried to tell their own stories as to what had happened in their camps. Hugh, the manager at Middle, managed to establish air time and related a story regarding Hugo M fighting a big fish that gave him a serious work out. Whilst fishing Snake Pit he hooked a fish that stripped him of all of his line and took him 300 yards into the backing with the drag on his reel as tight as it would go. 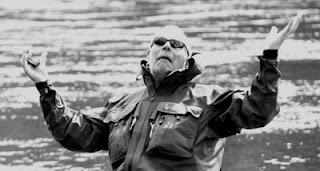 When it was clear that he was going to run out of line he started running down the river. 100 yards later he realised he could not keep up and summoned the boat. With some deft work his guide got him into the boat and started to follow the fish downstream. Sadly the fish continued to scream away to the White Sea and the inevitable “ping” that followed could only be acknowledged by a shrug of the shoulders and the fact that some of the big ones will get away. 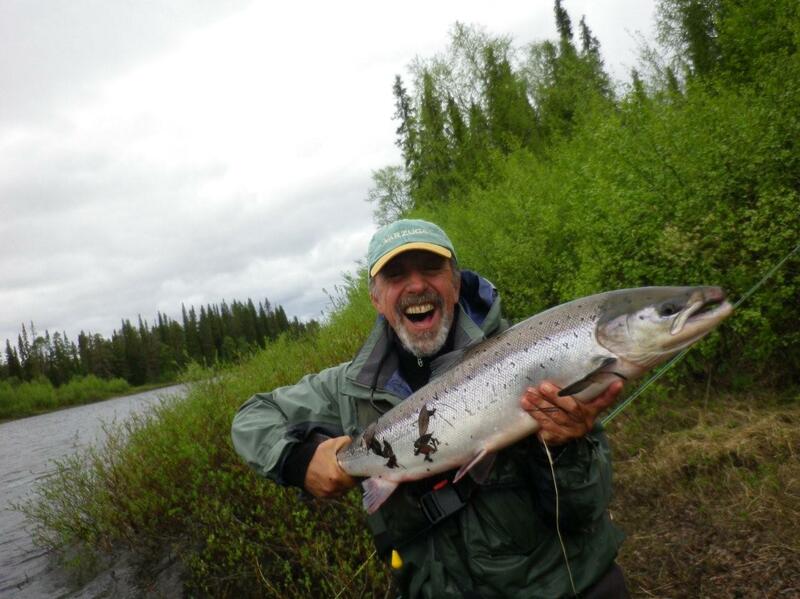 The 12 rods at Middle had 83 fish for the day with Jim R taking 12 fish to his rod. 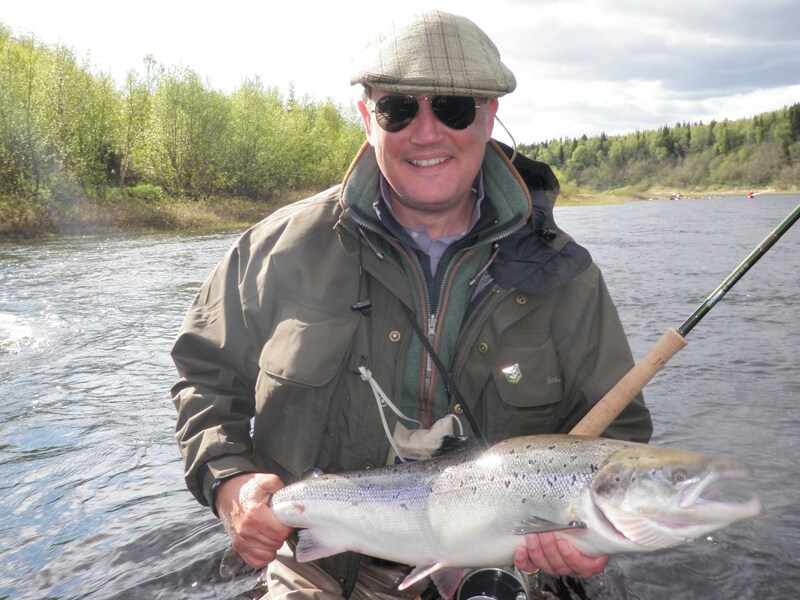 At Kitza we have a small team of 3 rods being looked after by TV star Paul Young. As was perhaps inevitable with his experience, Paul had 12 fish to end up as the top rod whilst the final total was 22 fish for the day. 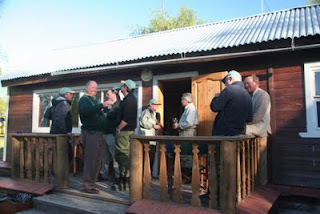 Further up river (by about 80 miles) we welcomed 8 friends back into Pana and their experience of the river showed. Jean H was the top rod with 13 fish and they had 40 in total with Barrie W landing a nice fish of around 12lbs from Northumberland Avenue. Here at Lower Varzuga our 7 rods had a slightly tougher day as they worked out the beat, the wading and the vagaries of fishing in Russia, of which 6 of them are new to. 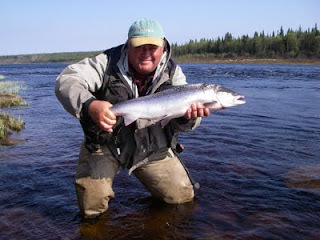 18 fish were landed with Julian P, the only rod who has been here before, taking 6 for the day. Whilst it might not have been quite the flier I was hoping for in terms of numbers, it is clear that our team here is determined to enjoy every minute of it and we had an excellent dinner last night that lasted well into the evening. It is a quite beautiful day today with much less of a breeze than we faced yesterday and lunch will be a picnic on the river. 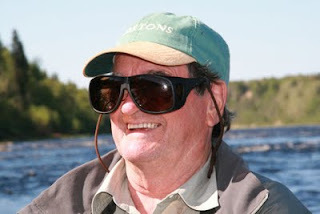 The water dropped by about an inch last night and most rods have now moved fully on to floating lines whilst a skated fly was tried yesterday evening. If this warm weather continues, this visually exciting way of fishing will become the norm and we can start to really experiment with summer fishing tactics.